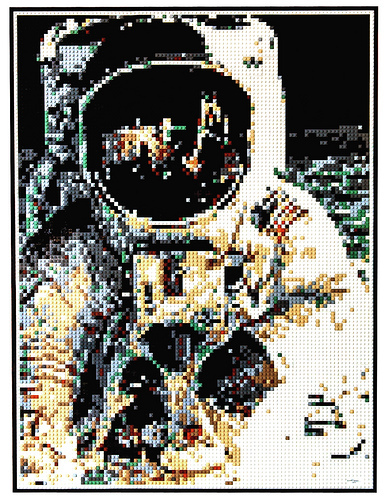 Dave Shaddix just finished this mosaic in honor of Buzz Aldrin’s recenly celebrated 83rd birthday. This is a great rendition of an iconic photograph. For the few who don’t know who or what is in the picture, it is a picture that Neil Armstrong took of Buzz Aldrin during the Apollo 11 moon landing in 1969. The LEM and Neil Armstrong are reflected in the visor of Buzz Aldrin’s spacesuit. Well done, Dave, I love it!